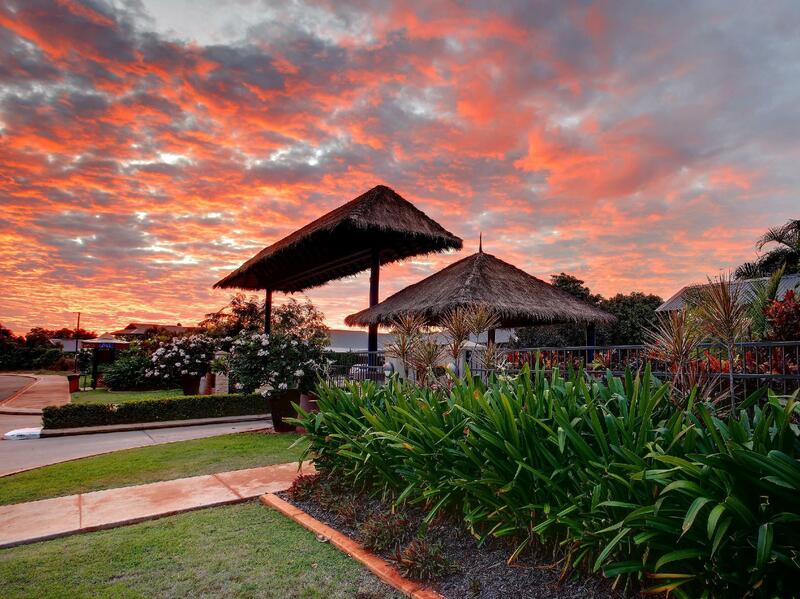 يقع فندق Mantra Frangipani Broome Hotel، المصمم ليناسب كل الضيوف سواء كانوا من رجال الأعمال أو السياح، في مكان ممتاز في أحد أكثر المناطق تفضيلاً في Cable Beach. يسهل الوصول إلى هذا الفندق ذو 4.5 نجوم من المطار، فهو يبعد عنه مسافة فقط. يشكل هذا الفندق ملاذاَ مريحاً للاسترخاء ويمنح زواره فرصة للاستجمام والتجدد، وهو يقع على بعد خطوات من المعالم السياحية الكثيرة للمدينة كمثل: Buddha Sanctuary, Willie Creek Pearls Cable Beach Showroom, Hidden Valley Handcrafts. يعمل Mantra Frangipani Broome Hotel على ضمان إقامة مريحة لضيوفه من خلال خدماته الممتازة وحسن ضيافته. يقدم هذا الفندق العديد من الخدمات الكفيلة بإرضاء أكثر الضيوف تطلباً. تتضمن كل غرف النزلاء وسائل الراحة والتسلية المصممة خصيصاً لضمان الراحة القصوى للضيوف. يقدم الفندق خدمات رائعة كمثل حمام سباحة خارجي, حديقة لمساعدتك على الاسترخاء بعد نهار طويل من النشاط والتجوال في المدينة. إن Mantra Frangipani Broome Hotel هو خيارك لخدمة الفنادق الراقية في برومى. The outside shower are definitely a plus. The grounds are lovely and well kept. Five stars for the staff. Laura is an amazing manager along with Paula and Alexandera as receptionists. Very accommodating and eager to please. Definitely would recommend. Quiet location a few mins drive from cable beach. We had a great stay here, we would have just liked it if there was there was room cleaning during our stay. I’m a weeks stay we had no room cleaning, we would have just liked it if our towels were changed a few times during the week, washing liquid and toilet paper replenished. These are just tips for improvement, we would recommend this place and enjoyed our stay here. P.S - please can all hotels ect start to provide pillows that are not the height of a tower block ! I have to sleep without a pillow in every hotel I stay at these days. This is a great place to stay. Its a 15 minute walk to the beach. I recommend you get transport no matter where you are staying in Broome. The rooms are huge and clean. They have everything you need to self cater during your trip. Each room has it's own BBQ area and outdoor bathroom. It has 2 pools. There is a bus stop straight out the front. it is $2 to get to the beach and $4 per trip per person no matter where else in Broome you are travelling. The best part about this hotel is how quiet it is. You'll get a fabulous night's sleep. Comfortable layout. Need bus/car to get around. We altered the Booking last minute due to death in family. Contacted Agoda who handled everything efficiently and told us they had contacted Hotel and all was ok. On arrival manager not happy and said not notified of change. Fortunately I had copies of both bookings and after discussion was checked in. Not a good start. Ok after that. The Mantra was an perfect retreat and a truly reasonable price. Absolutely the best bang for your buck in Broome. Outstanding atmosphere that put us at ease as soon as we walked through the door. Love it! Will definitely return! Peaceful, quiet & relaxing. Short walk to beach, restaurants & pub. Helpful friendly staff. Reasonably clean rooms. Town bus every hour at front entrance. Good price & will stay there again. Spacious room....s. Fantastic pools. 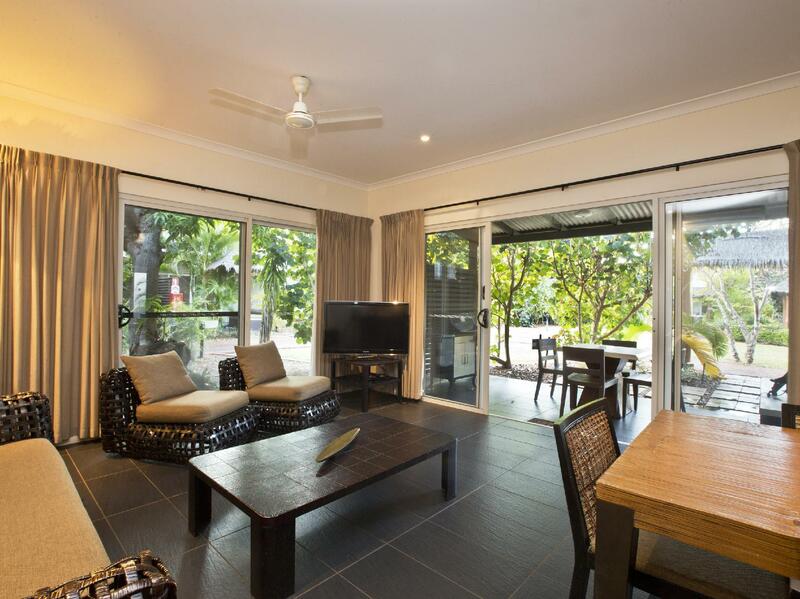 Great location, excellent proximity to cable beach. My stay at Mantra was superb. The room was very clean, spacious and well equipped. It had a nice veranda and the outside shower facilities. The hotel is located not far from the beach and the bus stop was just a few steps away. The staff were great, welcoming, very knowledgable and friendly. If I was going to Broome again, I'd definitely come back. 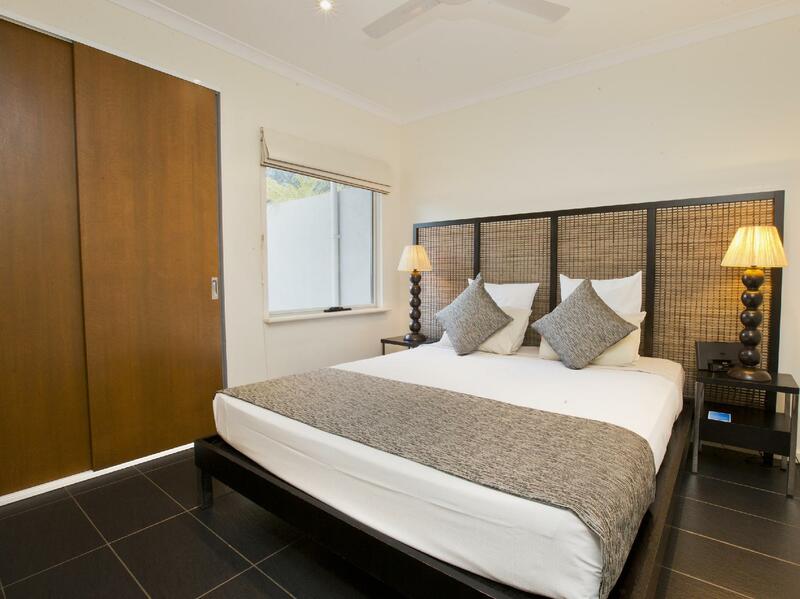 This was our 6th Stay at the Frangipani and would highly recommend it to anyone. Nice contemporary design and great facilities. Everything you need for a comfortable self contained holiday. Loved the night swims in the pool and the showers under the stars in the outdoor bathroom. Bicycle hire facility would be a good addition considering the distance to the beach and the tropical climat not suitable for walking during the day. Amazing room and facilities, location great, but need transport really (we hired a scooter from reception which was prefect and very well priced, plus cost us only $10 in gas for the week!). Bus stop is right out from also. Only thing missing from mantra frangipani is a little coffee shop! We loved it! Owner was very friendly, accommodating & let me check in early at 11am. Big spacious separate living room with a small dining table, self contained kitchen with full size fridge/freezer, microwave & a stove top element. Kitchen had all cooking utensils, cutlery, pots & pans etc etc. Living room had a big led samsung tv with heaps of channels. Room also comes with a washing machine, wash troth & a little outdoor cloths line next to the outdoor shower. The outdoor shower was fantastic with a good hot water system & a huge shower head. Wifi was good & allowed to use multipule devices. I didnt use the stove cooker, instead I used the BBQ outside my front door. 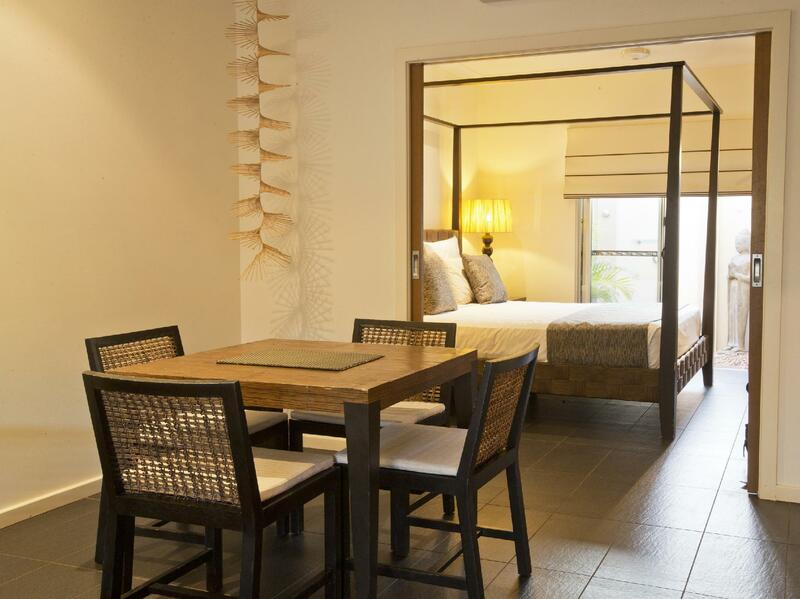 Hotel is about 10 minute walk to cable beach & surrounding bars/cafes & restaurants. Obviously the owner spared no expense when decking out the rooms due to the fact that the decor & furnishings are of high quality. One of the best hotels Ive ever stayed in. Very clean,comfortable & spacious. I thoroughly recommend this hotel to any body who is staying in the area. Had a wonderful week in this resort. It was airy and roomy and was great having own laundry facilities in the apartment. Bed was comfortable and the AC was appreciated on the 34 degree days. Swimming pool was refreshing and grounds were tidy and well maintained. All staff encountered were friendly and helpful. Thank you. Rooms are great with a kitchen that has all the modern equipement. Laundry is all modern also. 2 pools with great covers from the harsh sun. Cable beach is only an 8 minute work away, along the way there are coffe shops and a resort all within walking distance.